In the craziness of figuring out all of my medical treatments, I have forgotten to post Past Inspiration photos every Thursday. This morning as the sun was rising on my way to another appointment, my mom and I passed a snowy field covered with a thick layer of fog. It reminded me of my favorite sunrise in Indonesia. The fog blanketed the forest below where the world’s largest Buddhist Temple, Borobudur, is located (…see if you can spot where it is). On that day the sun rose perfectly at the peak of Mt. 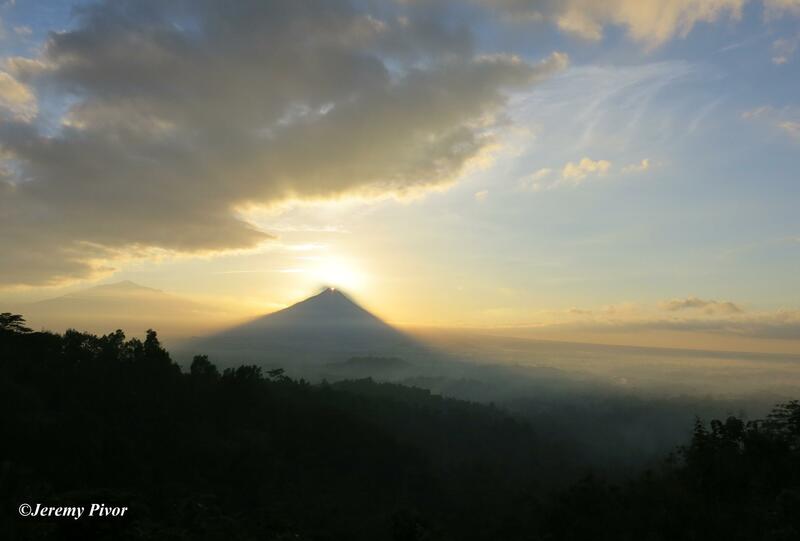 Merapi, an active volcano. It was such a peaceful morning, and reminds me that in the midst of countless appointments and treatments, to stay calm and appreciate those brief moments of serenity. You are really just one extraordinary human being. You are my current inspiration. What day/year was this taken? We have just been there and the sun rose slightly to the right. Interested in learning about days/times when it rises perfectly like that. Previous PostPrevious Calling all riders…join “Team Jeremy” to support brain tumor research! Next PostNext Past (and current) Inspiration – Patriots Super Bowl Champions…a hopeful serendipity!